Star Wars Half Marathon This Weekend At Disneyland Resort! WHAT: More than 23,000 runners from across the United States and 17 different countries are trekking to a galaxy far, far away for the debut of the Star Wars Half Marathon Weekend presented by Sierra Nevada Corporation at the Disneyland Resort this weekend. 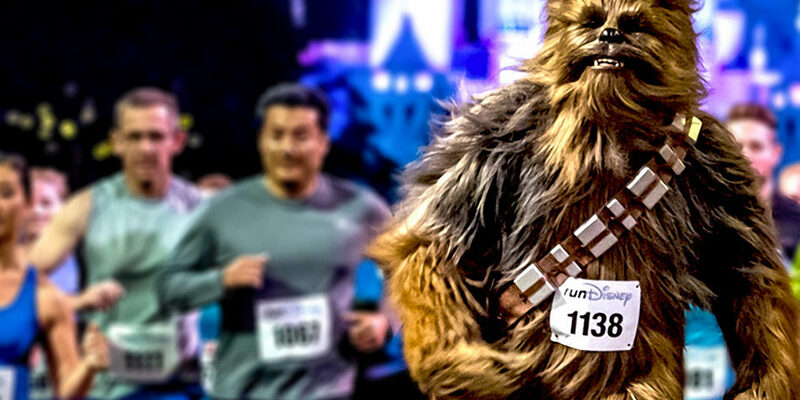 The new Star Wars-themed runDisney event will involve kids’ races, a 5K, a 10K and half marathon, plus several family-friendly events such as the Health & Fitness Expo and the Star Wars Wookiee Welcome Party. STORYLINE: LA-area military veterans Sandra Greenman and Jose Romero each struggled in their separate returns to civilian life, losing their jobs and their homes because of various addictions. Both were forced to live on the mean streets of metro Los Angeles, Sandra living out of her car starting in 2012 and Jose on the streets in 2013. But last year they became involved in the “Back On My Feet” program, the race weekend’s official charity which helps LA-area homeless people achieve independent living through running. Program participants run together three to four times a week at 5:30 am. As a result of the running program, both are beginning to live independently again, Sandra working in a government IT position and Jose off the streets and into his own apartment. Sandra and Jose, along with other program participants, are continuing their personal life development and training at the inaugural Star Wars Half Marathon Weekend at Disneyland Resort. Sunday, Jan. 18, 5:30 a.m.
Saturday, Jan. 17, 5:30 a.m.
Friday, Jan. 16, 5:30 a.m.
Saturday, Jan. 17, 9 a.m.
Thursday, Jan. 15, 9:30 p.m. – 11:30 p.m.
Thursday, Jan. 15, 10:00 a.m. – 8 p.m.
Friday, Jan. 16, 9 a.m. – 8 p.m. This is incredible! 🙂 I wish them all good luck!